In the last post, I began the topic of AdWords keywords by taking a step back – helping you think a bit more strategically about which of your products and services (i.e., keywords) it makes best sense to promote via AdWords. I also covered how you can use Google’s Keyword Planner to generate a great initial list of keywords related to your offerings. This week’s posts will expand a bit on the topic by addressing the concepts of 1) keyword match types, and 2) negative keywords. If you follow my blog on a regular basis, you know I’m a fan of AdWords. It’s amazingly powerful and simple… well at least it’s simple on the surface. And that’s where the danger lies. Google makes it VERY SIMPLE to quickly create campaigns using the default settings provided – But if you go down this path, you will ALWAYS SPEND MORE THAN YOU NEED TO! It’s not an intentional tactic by Google; it’s just that there are certain tradeoffs to making the AdWords platform user friendly for the average user. When it comes to keyword match types, that tradeoff can cost you a lot of money. 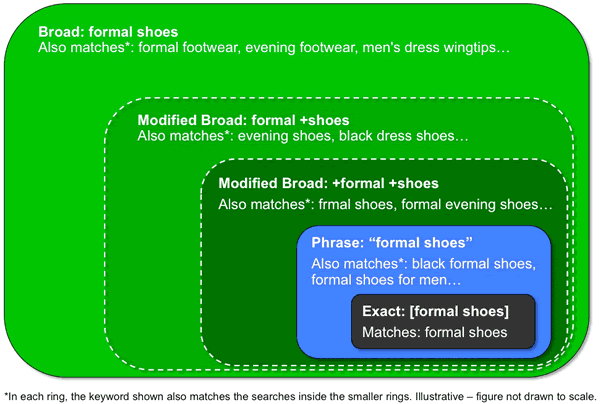 So what are keyword match types? Keyword matching options are used to help control which search terms trigger your specific ad. Think of match types as sitting on a continuum. On one end, you have a very inclusive match type (broad match). On this end of the continuum, you are giving Google tremendous flexibility on when your ad can be shown. Generally, this puts you in a position to get the MOST traffic possible. On the other end, you have a very restrictive match type (exact match). On this end of the continuum, you are in full control – since your ad will ONLY appear when a search is made for the EXACT keyword you are targeting. In general, this will generate less traffic, but the traffic you receive is all but guaranteed to be interested in what you’re offering. Here’s an image created by www.searchenginewatch.com that does a great job in illustrating how the match type you choose will determine the size of the “search net” you cast. Be sure and note the keyword in bold, and what types of user searches will trigger your ad under each match type. 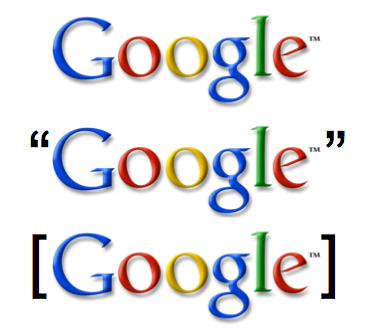 Broad match is Google AdWords’ default. AVOID USING THIS IN MOST CASES. It just gives Google way too much liberty to show your ads for unrelated search terms. In most cases, this means lower click-through-rates and lower quality traffic. More traffic doesn’t mean better traffic. There is an exception. If you are not overly concerned with budget, broad match can be a very effective way to “collect clicks” from a wide array of search terms. Over the course of a few weeks, you can use these actual search terms to refine your keywords… but once you’ve done this, I recommend discontinuing the use of broad match. When budget is super tight, consider using exact match. When you don’t have money to experiment… don’t experiment. Instead, develop a list of keywords that are 100% aligned with your specific product, use exact match, and then make sure the content of your keywords, ads, and landing pages are all tightly aligned. This will cause your ad to be shown less than other match types, but your pitch will be laser focused which should lead to higher quality scores, higher click-through-rates, and higher conversion rates. As your budget grows, it would be a good time to open up the traffic gates just a bit by considering modified broad or phrase match. In most cases, go with modified broad or phrase match. Here’s the sweet spot. Not too broad, not too restrictive. My personal strategy is to lead with modified broad, this gets me the best chance at producing relevant traffic, while also opening the door to search variants I may not have identified on my own (i.e., using actual user search terms to identify new keywords). Also, as I identify keywords that seem like winners based on click-through-rates and/or conversion rates, I’ll “lock them down” a bit by switching from modified broad to phrase match. Technically, there’s a final match type: a negative keyword. For some reason, I’ve always had a difficult time considering it an actual match type. I tend to view it uniquely… and for good reason. Including negative keywords into your AdWords campaigns is a powerful way to reduce the clicks (i.e., $$$) associated with irrelevant searches. Back in 2005, I was managing AdWords for a company in the HR industry. One of the products we sold was a 360 feedback survey (used for leadership development within companies). In some parts of our AdWords campaign, broad match was being used to cast a wide net for our 360 survey product. But there was a problem. This little company named Microsoft launched a new gaming console in 2005 called the XBOX 360. You guessed it, our impressions and clicks immediately spiked but our click through rates and conversions plummeted. Our ads were getting triggered by all the gamers wanting to get a sneak peak at the new XBOX 360. Many of them actually clicked on our ad (costing us $5 per click in the process!) only to find our site had nothing to do with the XBOX… money down the drain. Luckily I discovered it quickly and added the negative keywords “xbox” and “Microsoft” to prevent our ads from appearing for those searches. Other times, there is just no way to predict the crazy search terms people will use that are not a fit for your business. In these cases, it pays to proactively monitor the search terms that have been generating clicks for your ads. Google makes it very easy to see this information. At “All online Campaigns”, the individual campaign level, or the adgroup level, click on the Keywords Tab. Then click on the Details dropdown menu. Then select All under SEARCH TERMS. Negative keywords really are a big deal when it comes to your AdWords’ return-on-investment. It’s not uncommon to quickly identify 10%+ of a clients’ budget that is being wasted on low quality clicks simply because they were not proactively using negative keywords. Don’t be one of them. Follow the tips outlined here and stretch your AdWords budget further! Next week we’ll move on to discuss best practices for getting higher click-through-rates on your text ads!